"His music has a loose, aggresive edge, but in his quiter moments, Sweany recalls the supple beauty of Ry Cooder's 70s readings of Depression-era pop blues." - MOJO (UK) "New Blues Explosion!" But Patrick wouldn't stay in the acoustic world for long. His love of 50s era soul and rock fused with the adrenaline-soaked garage punk revival happening throughout the Rust Belt pushed Pat to form a band. After 4 critically acclaimed CDs (two produced by longtime collaborator and grammy award winner Dan Auerbach of The Black Keys), Patrick has expanded his touring radius to 49 states and the UK. 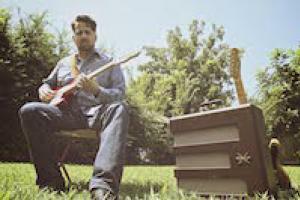 He's played premiere festivals all over the U.S., and supported national acts such as The Black Keys, The Gourds, The Wood Brothers, Wayne Hancock, Hot Tuna, and Paul Thorn on tour. His latest record, Close To The Floor, hit the streets July 16, 2013. It was recorded to 2" tape in Nasheville, TN and features contributions from Joe McMahan (Luella & The Sun, Allsion Moorer, Webb Wilder), Ron Eoff (Cate Brothers, Levon Helm), Jon Radford (Justin Townes Earle, Lilly Hiatt), and Ryan Norris (Lambchop), among others. Close To The Floor is a gritty, hard look at some very difficult recent events in Sweany's life and recalls the halcyon days of Muscle Shoals releases by Dan Penn, Eddie Hinton and Leon Russell.